Hello to all regular readers of the Rotary clubs fortnightly column! This fortnight I have entitled my article “We can, They Can’t” ……so what does this mean? It means to me, that so many expats living in this beautiful island, with its generous friendly people, amazing scenery, traditional customs and culture going back hundreds and hundreds of years, are able to live here very comfortably…unfortunately for so many Balinese, and Indonesians this is not the case. As we are all aware conditions vary considerably as do earnings, and not everyone gets the opportunity of a full education leading to gainful employment. The education system is varied to say the least, although this is not my topic today, but HEALTH is! Even if we expats do not have private health insurance either in Bali or your home country we can still afford to be treated here. There are many very good hospitals, dental clinics and specialist clinics available to us. But to the people of this island, health care is not free! Families have to pay every month into the government’s scheme and even then they are not fully covered for all treatments, medicines etc. Those who live in the towns or near to towns can access care if needed, and often have to take loans, apply to the banks, or their families to help pay the bills. This of course then has to be repaid! However to many people in Bali, because of where they live they have absolutely no access to any kind of medical care. Nor do they have the money to even consider it. So they go without, or go to local medicine healers….I am not saying they are not credible but sometimes western medicine is required. So, Rotary Club Bali Ubud Sunset’s latest project was to sponsor “ Rumah Sehat/ Yayasan Kita Peduli” in providing a Healthy Day. This is a broad based community initiative set up in 2011 by Sue and Ray Bishop, also members of RCBUS, providing remote village families in Karangasem region with basic health care, nutritional and hygiene education and also vocational training through the Pricilla Hall Memorial Foundation. HEALTHY DAY – When sponsorship is offered, as in this case by RCBUS, the organisational process goes to work. Firstly an area in great need of free health care, always a very remote village is located. Consultation with the local Kepala Desa, Banjar and Rumah Sehat takes place. Once a village and a venue is established, next a date is set, usually several weeks in advance. The villages have to have the day advertised and the necessary medical personnel have to be approached with the date and confirmation they can attend. On October 6th 2018, a Healthy Day took place in the local school in Kendampal, east Bali. The village is 12 kms up Mount Agung, YES up the mountain, only 4 kms from the summit! Thankfully the Gods were with us, a perfect day, and Mt. Agung kept very quiet for us. This village has over 514 families and no medical care….many are elderly and have never left their village. So now please imagine general doctors, nurses, ophthalmologists, dentists, physiotherapists, pap smear and breast screen professionals, pharmacists, plus all the volunteers, driving up the mountain with all their equipment? Not to mention food,water, cleaning materials, etc. etc. Quite a feat, you may say and you would not be wrong. The day before, much cleaning at the school was carried out by volunteers and the various classrooms turned into “surgeries”. People start arriving about 8am for registration then to be seen by the appropriate professional. Those wishing to have pap smear and breast screening, and the women do have to be encouraged, have to go through an educational talk/power point by the gynaecologist before having the physical tests. Following this they are given a food box, which most mothers promptly give to their children. All the school children turned up even though they had the day off. Following the physical exams, they were given a ladies incentive pack. Things we take for granted. Over 300 adults were treated on the day, 9 cataracts detected which will require surgery, plus distribution of glasses and in some cases eye drops. Breast screening – 6 lumps detected, 1 definite cancer, 1 throat cancer, much dental work carried out, and over 200 children instructed in dental hygiene and rewarded with a free toothbrush and toothpaste. All volunteers and this includes the medical personnel were provided with morning snacks, water, and a lunch time food box. Woh!! WHAT A DAY! But was it worth it. We Can, They Can’t…. Rotary Club Bali Ubud Sunset has also sent funds to assist in the disaster in Palu as we did for the Lombok disaster fund. To finish I would like to take this opportunity to advertise our 1 and only fund raiser of the year. YES just one, and with this we hope we can fund another year of great projects, to benefit the Bali population. 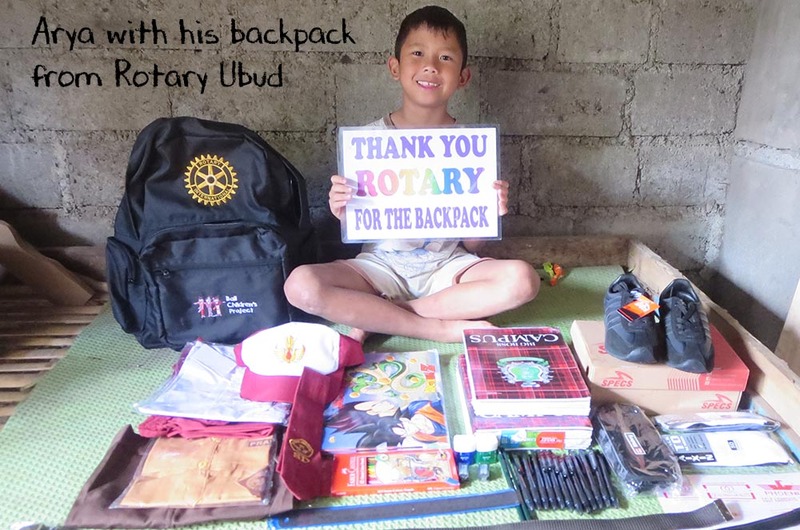 Written by Renee Heaton, member Rotary Club Bali Ubud Sunset. One of the 21 children we sponsored through The Bali Children’s Project so they could continue their education. A child, to be able to go to school, MUST have 3 uniforms, books, pencils, paper, books, shoes, backpack, etc. Many children’s families cannot afford that. So The Bali Children’s Project steps in and supplies these items to needy children. Our club is happy to contribute to their education! Rotary World Wide – Doing good! Ubud’s HIV/AIDS Clinic Opens Officially! ‘Body Music’ Was a Great Success! What does a Water Project Look Like?